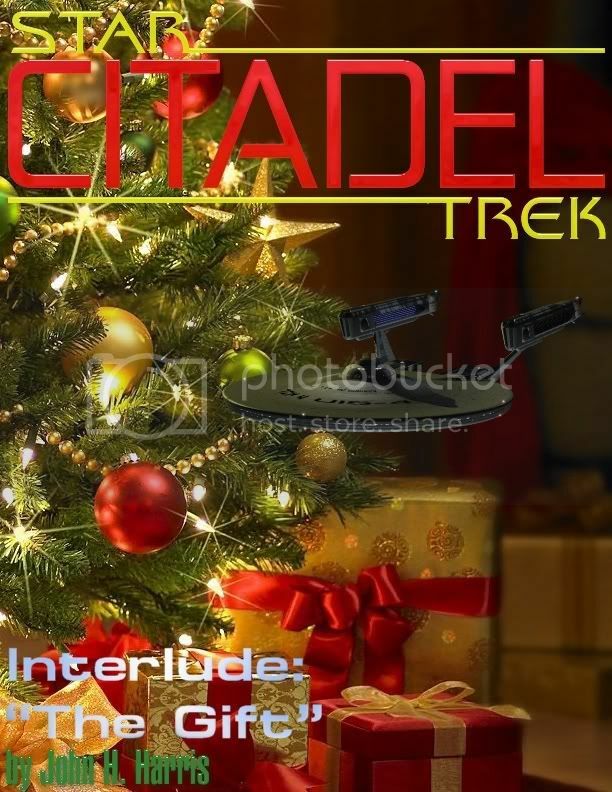 Re: ST: CITADEL - Interlude, "The Gift"
Nice work, John. I really like that Am... oh, I can't remember the class of the ship. Let's just say that the Sentinel looks really cool there, my friend. Keep up the great and awesome work, sir. "All of Time and Space; everywhere and anywhere; every star that ever was. Where do you want to start?" Thanks to FltCpt. Bossco for my Tattok avatar. This is Tattok when he assumed the position of Commander-in-Chief, Starfleet in the year 2411. Ah, I can already see the tree on the Ernst Ruska decorated with care in the hope that Saint Nick will drop the crew off something neat. There's no room on the Espero for the Christmas tree but Ikar does encourage Secret Santa with her crew. Anyways, I'd love to see the Intaran equivalent. Well, the Marshal Martz doesn't have an "official ship's tree", but those who celebrate usually decorate one of the trees in the arboretum. It was a short walk from the turbolift to the lounge they called The Opera House. It wasn’t the first time either of them had looked out on Intar from the expansive windows of a Nottingham class ship, but what they saw out there this time was different. There, in the light of the Intaran sun, was a starship, close enough for the two Intarans to see that it bore both Federation and Intaran script upon it. The captain led the two big men over to the center of the lounge, where a ramp led down to a large airlock door, which was open. Beyond, they found a small craft docked, with a large window at the front. Yineth keyed a short series of commands into the small panel next to the open doors, which puffed closed as he stepped to the front of the craft. A moment later, there was a slight jolt as the pod detached from the Ernst Ruska. Instead of the tree farm they expected, Rina and M’Rowri found themselves materializing in one of the Blount Island’s transporter rooms. “I did warn you,” Rina said, indicating her own lined coat. The travel pod gently backed into place, and the three men heard and felt the muffled clunk of the docking latches engaging. He then stepped to the back of the pod and triggered the hatch release, allowing the doors to open. Beyond, in the small lounge onto which the hatch opened, they found a gaggle of press, both Intaran and Federation. There were also a number of people in Starfleet uniforms. “United World of Intar, Arriving,” the computer announced, just before the youngest of the Starfleet personnel blew a long, whistling note on an unusually-shaped pipe, alternating it with a higher note. As he did so, the other people in uniform snapped to attention. Not knowing Federation protocol in such a situation, Kodo addressed the only person he did recognize. I like it! No, I love it! Erias Sloe will be awesome. I like this, John. Keep up the great work because I can't wait to see where this goes. Well, let me know if you need help. I'd be happy to bounce around a few ideas. Were you still using the violinist that you introduced me to? Or do you need an older actress for the daughter? I think we'll still use her. Thinking someone like Apolo Ohno for her husband. He definitely works for ya. Do they have kids? I'm also wondering if this would be the time that Yineth Lerra comes to Intar. Maybe she's a member of the Starfleet crew assigned to the Sentinel while they teach the Intarans how to run her?